Creating a unique lighting design for Denmark’s first workshop for history & arts. The purpose of the project was to develop an interactive light installation that was capable of improving the quality of the heavily trafficked public space surrounding the building as well as communicating the historical and artistic collections of the organisation History & Art in new innovative ways to pedestrians passing by and attract them to further explore the location. 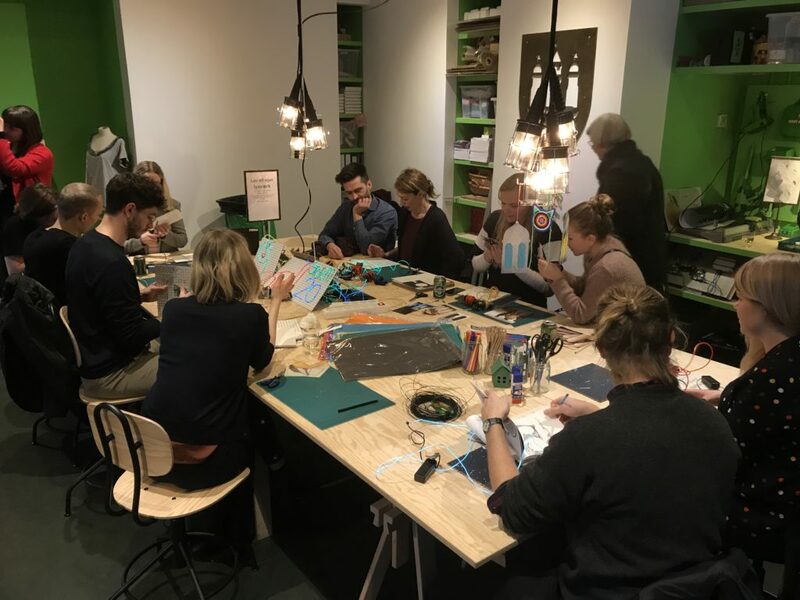 We wanted an installation placed in one of the windows of the creative history and art makerspace STORM20, displaying small bits of stories about Copenhagen, its history, its people and its art through the medium of light. The installation was to be placed at street level and react to movement, adding an exciting new element to the public space around the building. Furthermore, it was to create a feeling of direct interaction between the installation and the public. Through the installation we also wanted to improve the present indoor light conditions, support a soothing atmosphere and to maintain a high communication level between the outdoor and indoor environments. We decided to choose a solution, where three horizontal panels with LED matrices where placed in one of the windows. This made it possible to create an installation that could display the collections in new ways, inviting the audience to interact with the installation and content. Aalborg University and Andrei Ducu Predescu presented a concept with the idea of a window both displaying the collections on the outside screen and showing the reflections of the passersby on the inside screen. 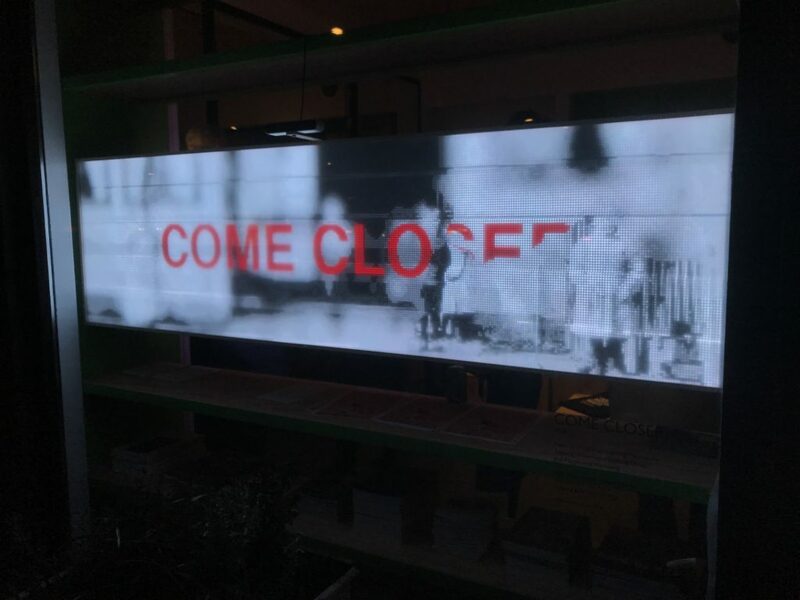 The installation entitled “Come Closer” introduces a digital window which expands the array of parameters through which we experience our environment. It challenges the preconception of conventional fenestration, architecturally defined as a device where mechanisms of negotiation, filtered by factors such as light, temperature or an indiscreet gaze, take place. As a metaphor, a window is synonymous with discovery, through it a piece of knowledge is revealed. In “Come Closer” the revelation of knowledge within the object itself becomes the key element. The desire was to design an experience where individuals become responsible for acquiring and filtering knowledge through their own movements, and ”Come Closer” creates awareness of knowledge being within reach, but leaving the responsibility of uncovering it up to the individual. This installation needed to be custom-made since this way of displaying artistic and historic collections combined with an interactive dimension had not been done before. In collaboration with Aalborg University and Playground Marketing, we found a software and hardware solution that matched our budget, time frame and concept. The installation ended up as a two-sided entity, where the outdoor visual disturbances are reflected on the inside. In this way a segregation of the indoor and the outdoor is avoided. 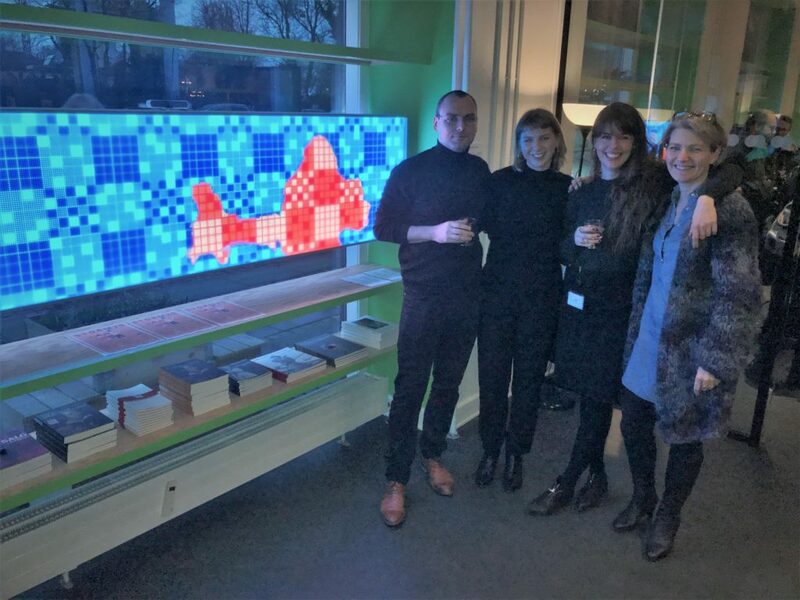 Inspired by the special tiled floors at Thorvaldsen’s Museum, a graphical reinterpretation was developed and displayed on the inside of the installation, where the outdoor activities were possible to register from the inside. We are currently trying to develop the installation to be possible to display in a video format. Aalborg University – Lighting Design presented their concept ideas after they had been given an introduction, including the specification and needs for the project by History & Art. The concept, design development and solution were conducted in dialogue between Aalborg University and STORM20. Playground Marketing ApS manufactured and constructed the model and hardware in collaboration with Aalborg University. History & Art developed the content for the display. The installation was made of three horizontal panels with an array of LED matrices pointing towards the street. We used graphics cards and controllers for the LED panels to ensure responsiveness. Via a stereoscopic depth sensing camera placed on the window pointing towards the street it was possible to register pedestrian movements. We connected a PC with graphics power to ensure smooth live processing of depth data and the communication to the LED panels via the controllers. A special frame was built to house the LED panels, and a diffusing layer of acrylic was added to smooth the light both inside and outside of the LEDs. Playground Marketing ApS provides support and service until December 2018. This solution made it possible to display the historical and artistic collections in new ways that managed to stimulate the audience to engage with the content. A more traditional solution would have been to display the content through a normal screen. Hence, it created a new way of interaction as well as engaging and improving the surrounding public space. We would have engaged Playground earlier in the process and tested the various concepts and ideas more. We would have developed the software earlier – to be able to display video format – and worked with a longer time frame. It is possible to scale up the installation and involve new partners such as artists, students etc. to create new content for the installation.